North America’s all-time leading jockey by victories, Russell Baze, is approaching another major milestone in his Hall of Fame career. Baze, 54, is scheduled to get a leg up for his 50,000th career mount in the sixth race on Friday at Golden Gate Fields. Baze, who has 11,836 career wins through Jan. 24, has 49,994 Thoroughbred mounts to date and is scheduled to ride in each of the first six races on Friday. If all goes as planned, with none of Baze’s mounts scratched, he would reach the milestone aboard Finish Rich in NYC in the sixth race, a six-furlong claiming race. Baze, a native of Vancouver, British Columbia, was inducted into the Racing Hall of Fame on Aug. 9, 1999, along with trainer D. Wayne Lukas. 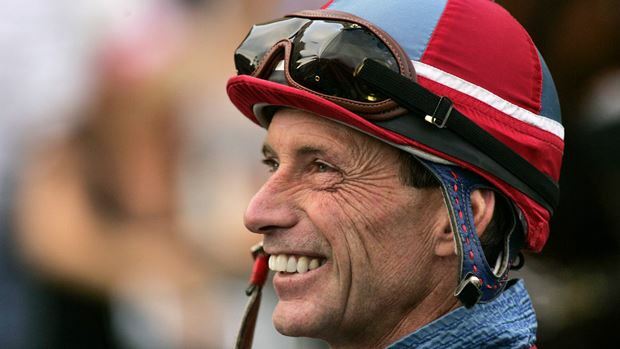 Baze has won 44 riding championships at Golden Gate Fields, and also led the jockey standings 40 times at now-defunct Bay Meadows Race Course. Has led the nation in victories 12 times. Baze was honored with a special Eclipse Award in 1995 for being the first jockey ever to win 400 or more races in a year for four consecutive years. He has won 400 races in a year 13 times; no other jockey has won 400 races in a year more than three times. Baze recorded his 5,000th career win aboard Cyrus Says on July 29, 1995 at Sonoma County Fair and then continued to pile up victories. He passed the legendary Bill Shoemaker and moved into second place on the all-time win list for jockeys when he notched his 8,834th career win aboard Hollow Memories in the seventh race at Golden Gate Fields on Jan. 22, 2005. He then overtook the great Laffit Pincay, Jr. as the winningest jockey in North American Thoroughbred racing history when he recorded career victory No. 9,531 aboard Butterfly Belle in the fourth race at Bay Meadows on Dec. 1, 2006. Pincay was forced into retirement by injuries in 2003 with 9,530 wins. Baze became the first jockey in North America to win 10,000 races when he recorded the landmark victory aboard Two Step Cat in the third race at Golden Gate Fields on Feb. 1, 2008. He recorded his 11,000th career win on Aug. 14, 2010 at Santa Rosa when he won the fourth race aboard Separate Forest. He trails only South American jockey Jorge Ricardo for most all-time victories worldwide. According to statistics provided by Equibase Company, North American all-time leading rider by wins, Russell Baze, is scheduled to make his 50,000th career start on Friday, Jan. 25, at Golden Gate Fields where he is listed to ride in the first six races. Baze will become the first North American rider to reach that number. Since January 1, 1976, Baze’s races total 343,354 furlongs which equals 42,919 ¼ miles and the total time elapsed for those races is 1,144 ½ hours which equals nearly 48 days (calculated based on one furlong averaging 12 seconds).